Due to the international setting of our congregation, our worship services are designed to appeal to a broad range of Christians from around the world. It is our experience that traditional Methodist Services with hymns, kneeling at communion and for prayer are common to many countries and cultures. 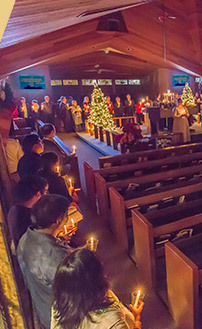 So while the liturgy may be traditional, the preaching, the energy and the soul of First UMC is fully contemporary and appropriate to mission and ministry in the Silicon Valley. 9:00 A.M. — A Small service in our Sanctuary with prayer, hymns and a sermon. 10:30 A.M. — Our main worship service with choir, children's message and a sermon. Communion is celebrated the first Sunday of every month. Learn more about Communion.